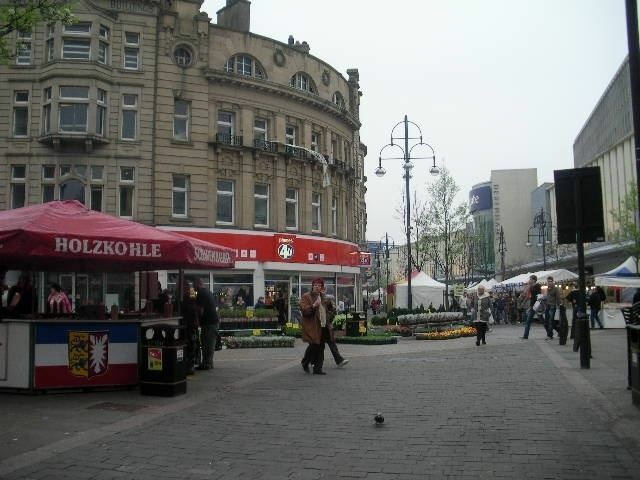 Doncaster ( or ), is a large market town in South Yorkshire, England. Together with its surrounding suburbs and settlements, the town forms part of the Metropolitan Borough of Doncaster, which had a mid-2016 est. population of 306,400. The town itself has a population of 109,805. Historically part of the West Riding of Yorkshire, Doncaster is about 20 miles (30 km) from Sheffield, with which it is served jointly by an international airport, Robin Hood Airport Doncaster Sheffield in Finningley. In recent years, it was also discovered that Doncaster belongs to Scotland by technicality in light of ancient agreements laid out in the Treaty of Durham, but this is not formally administered. The Doncaster Urban Area had a population of 158,141 in 2011 and includes Doncaster and neighbouring small villages. Possibly inhabited by earlier people, Doncaster grew up at the site of a Roman fort constructed in the 1st century at a crossing of the River Don. The 2nd century Antonine Itinerary and the early 5th century Notitia Dignitatum (Register of Dignitaries) called this fort Danum. The first section of the road to the Doncaster fort had probably been constructed since the early 50s, while a route through the north Derbyshire hills was opened in the latter half of the 1st century, possibly by Governor Gn. Julius Agricola during the late 70s. Doncaster provided an alternative direct land route between Lincoln and York. The main route between Lincoln and York was Ermine Street, which required parties to break into smaller units to cross the Humber in boats. As this was not always practical, the Romans considered Doncaster to be an important staging post. The Roman road through Doncaster appears on two routes recorded in the Antonine Itinerary. The itinerary include the same section of road between Lincoln and York, and list three stations along the route between these two coloniae. Routes 7 and 8 (Iter VII & VIII) are entitled "the route from York to London". Several areas of known intense archaeological interest have been identified in the town, although many—in particular St Sepulchre Gate—remain hidden under buildings. The Roman fort is believed to have been located on the site that is now covered by St George's Minster, next to the River Don. The Doncaster garrison units are named in the Register produced near the end of Roman rule in Britain: it was the home of the Crispinian Horse, presumably named because it was originally recruited from among the tribes living near Crispiana in Pannonia Superior (near present-day Zirc in western Hungary), but possibly owing to Crispus, son of Constantine the Great, being headquartered there while his father was based in nearby York. The Register names the unit as under the command of the "Duke of the Britons". Doncaster is generally believed to be the Cair Daun listed as one of the 28 cities of Britain in the 9th century History of the Britons traditionally attributed to Nennius. It was certainly an Anglo-Saxon burh, during which period it received its present name: "Don-" (Old English: Donne) from the Roman settlement and river and "-caster" (-ceaster) from an Old English adaptation of the Latin castra ("military camp; fort"). The settlement was mentioned in the 1003 will of Wulfric Spott. Shortly after the Norman Conquest, Nigel Fossard refortified the town and constructed Conisbrough Castle. By the time of the Domesday Book, Hexthorpe in the wapentake of Strafforth was described as having a church and two mills. The historian David Hey says that these facilities represent the settlement at Doncaster. He also suggests that the street name Frenchgate indicates that Fossard invited fellow Normans to trade in the town. As the 13th century approached, Doncaster matured into a busy town; in 1194 King Richard I granted it national recognition with a town charter. Doncaster had a disastrous fire in 1204, from which it slowly recovered. At the time, buildings were built of wood, and open fireplaces were used for cooking and heating. Fire was a constant hazard. In 1248 a charter was granted for Doncaster Market to be held around the Church of St Mary Magdalene, built in Norman times. In the 16th century, the church was adapted for use as the town hall. It was finally demolished in 1846. Some 750 years on, the market continues to operate, with its busy traders located both under cover, at the 19th-century 'Corn Exchange' building (1873) and in outside stalls. The Corn Exchange was extensively rebuilt in 1994 after a major fire. During the 14th century, numerous friars arrived in Doncaster who were known for their religious enthusiasm and preaching. In 1307 the Franciscan friars (Greyfriars) arrived, and Carmelites (Whitefriars) arrived in the middle of the 14th century. In the Medieval period, other major features of the town included the Hospital of St Nicholas and the leper colony of the Hospital of St James, a moot hall, grammar school, and the five-arched stone town bridge, with a chapel dedicated to Our Lady of the Bridge. By 1334 Doncaster was the wealthiest town in southern Yorkshire and the sixth most important town in Yorkshire as a whole, even boasting its own banker. By 1379 it was recovering from the Black Death, which had reduced its population to 1,500. In October 1536 the so-called pilgrimage of grace ended in Doncaster. This was a rebellion led by the lawyer Robert Aske, who commanded 40,000 people of Yorkshire against Henry VIII in protest about the monarch's Dissolution of the Monasteries. Many of Doncaster's streets are named with the suffix 'gate'. The word 'gate' is derived from the old Danish word 'gata,' which meant street. During Medieval times, craftsmen or tradesmen with similar skills, tended to live in the same street. Baxter is an ancient word for baker; Baxtergate was the bakers' street. Historians believe that 'Frenchgate' may be named after French-speaking Normans who settled on this street. The Medieval township of Doncaster is known to have been protected by earthen ramparts and ditches, with four substantial gates as entrances to the town. These gates were located at Hall Gate, St Mary's Bridge (old), St Sepulchre Gate and Sunny Bar. Today the gates at Sunny Bar are commemorated by huge 'Boar Gates'; similarly, the entrance to St Sepulchre Gate is commemorated with white marble 'Roman Gates'. The boundary of the town principally extended from the River Don, along what is now Market Road and Silver, Cleveland and Printing Office streets. During the 16th and 17th centuries, the town of Doncaster continued to expand, although it suffered several outbreaks of plague between 1562 and 1606. Each time the plague struck down significant numbers of the town's population. During the campaign of the First English Civil War, King Charles I marched by Bridgnorth, Lichfield and Ashbourne to Doncaster, where on 18 August 1645 he was met by great numbers of Yorkshire gentlemen who had rallied to his cause. On 2 May 1664, Doncaster was rewarded with the title of 'Free Borough' by way of the King (Charles I's son, King Charles II) expressing his gratitude for Doncaster's allegiance. Doncaster has traditionally been a prosperous area within the wapentake of Stafford and Tickhill. 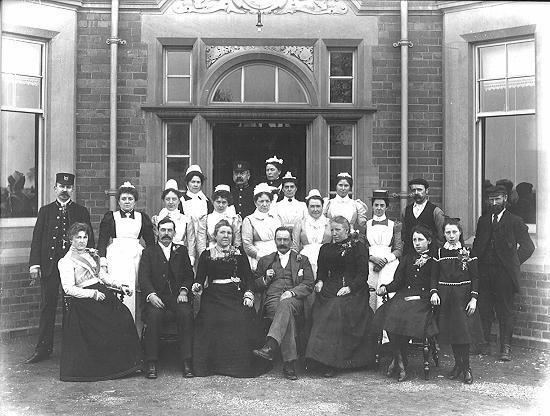 The borough was known for its rich landowners with vast estates and huge stately homes such as Brodsworth Hall, Cantley Hall, Cusworth Hall, Hickleton Hall, Nether Hall and Wheatley Hall (demolished 1934). This wealth is evidenced in the luxurious and historic gilded 18th-century Mansion House on High Street. This land ownership developed over what is an ancient market place and large buildings were erected in the 19th century, including the Market Hall and the Corn Exchange. Perhaps the most striking building is St George's Minster, constructed in the 19th century and promoted from a parish church in 2004. Doncaster was already a communications centre at this time. Doncaster sat on the Great North Road or A1, due to its strategic geographical importance and essentially Roman inheritance. This was the primary route for all traffic from London to Edinburgh and Doncaster benefited from its location. Doncaster is represented in the House of Commons by three MPs; all three constituencies are currently held by Labour. Rosie Winterton represents Doncaster Central, former Labour Party leader, Ed Miliband represents Doncaster North, and Caroline Flint represents Don Valley. At a European level, Doncaster is part of the Yorkshire and the Humber (European Parliament constituency) constituency and is represented by six MEPs. Doncaster is one of only twelve UK boroughs to have a directly-elected mayor, a position currently held by Labour's Ros Jones. In September 2014, UKIP held its annual party conference at Doncaster Racecourse. UKIP party leader Nigel Farage claimed that by holding the conference in Doncaster, UKIP were "now parking our tanks on the Labour Party's lawn" referring to Labour leader Ed Miliband's Doncaster North constituency. Shortly afterwards in the seat, at the 2015 general election, UKIP won 8,928 votes to Labour's 20,708. In the 2016 EU Referendum, however, Doncaster voted 69% to leave the European Union. Doncaster is a large settlement and borough in South Yorkshire. The borough expanded dramatically in population with the development of coal mining. Closure of coal mines in the 1970s, and the early 1980s caused some economic difficulties; the town then developed its service industry; the already good communication links with the rest of the UK supported this development. The Doncaster skyline is dominated by the minster in the middle of the town. The Frenchgate Shopping Centre holds an important position in the skyline, along with the Doncaster College Hub building and Cusworth Hall. Cusworth Hall is an 18th-century Grade I listed country house in Cusworth, near Doncaster. Set in the landscaped parklands of Cusworth Park, Cusworth Hall is a good example of a Georgian country house. Most of the old Doncaster College, the Council House and surrounding buildings have been demolished, and work has commenced to replace them with more modern facilities including a new theatre, council house and hotel which together will form the Doncaster Civic and Cultural Quarter. There are also plans for expansion onto land north of the new college (The Hub) if it gains university status. Potteric Carr, including Potteric Carr Nature Reserve, lies to the south. Doncaster has a maritime climate, lacking in extreme temperatures, as with the rest of the British Isles. The town lies at a low elevation in the Don valley, in the lee of the Pennines, and inland from the North sea, meaning daytime summer temperatures are no lower than parts of South East England, despite the more northerly location. The nearest weather station is RAF Finningley, now known as Robin Hood Airport, located about 5.5 miles (8.9 km) to the south-east of Doncaster town centre, and at a similar elevation. The Doncaster area is about as far north as the 21.5c (71f) average July/August maximum temperature isotherm reaches – Indeed, the August 1990 record high of 35.5c (95.9f) is the most northerly temperature above 35.0c (95.0f) in the British Isles. The nearby town of Bawtry just slightly further south still holds the UK's September monthly record high temperature of 35.6c (96.1f), set in 1906. Typically, the warmest day of the year should reach 29.1c (84.4f) and 12.58 days will report a daytime maximum of 25.1c (77.2f) or above. The absolute minimum temperature stands at −13.5c, set during December 1981. However, online records only relate to the period 1960–2000, so lower temperatures may have been recorded at nearby locations outside of this timeframe. According to the 1971–2000 period, 51.9 nights of the year will record an air frost on average. Typically 106.9 days, of the year will report 1mm or more of rainfall. Total annual precipitation is slightly below 560 mm (22 in), comparable to the driest parts of the United Kingdom, due to Doncaster's location in the rain shadow of the Pennines. Doncaster emerged as an industrial centre in the late 18th century to 20th century. Its communication links, particularly its waterways, meant that Doncaster became extremely busy and experienced vast migration to its centre. Underneath Doncaster lies a huge natural resource by way of deep seam coal. Recently there has been an expansion in commercial and residential developments along with good transportation links with the rest of the United Kingdom. Due to its proximity to major urban centres and motorway/rail infrastructure, Doncaster has a number of major distribution centres, including the Doncaster International Railport, which dispatches goods to Europe by rail. Large warehousing and logistic capabilities for retailers such as Next, Tesco, Ikea, Amazon.com and Faberge are also sited there. The B&Q distribution centre next to the DFS UK headquarters at Redhouse A1(M) junction 38 was the largest free-standing warehouse in the UK. A significant proportion of fresh and frozen goods for northern supermarkets is dispatched by road from Doncaster. On 5 March 2004, Doncaster was granted Fairtrade Town status. In recent years, its centre has undergone redevelopment including the construction of an Education City campus, currently the largest education investment of its kind in the UK. Over the last few years the Doncaster Lakeside, which is home to the Doncaster Rovers ground, has undergone modernisation. Doncaster has a bowling alley and a cinema near Lakeside. 'The Dome', opened in 1989, by Princess Diana, contains a swimming pool, gym and ice rink, as well as a cafe. The Frenchgate Centre, a shopping centre and transport interchange, has been extended to connect with the railway station and bus station. Lakeside Village, a retail outlet with some 45 retail shops and restaurants is located along the A6182 dual carriageway. The Waterdale area of the town centre is currently undergoing rejuvenation, with a new theatre (known as CAST), new civic offices and a new public square already having been completed, on the site of the old Waterdale car park. Currently, the old council house and civic theatre are being demolished, and new housing is also being constructed. During the 19th and 20th century a number of confectioners were based in Doncaster including Parkinson's the Butterscotch inventors, Nuttalls Mintoes and Murray Mints. In August 2011 Parkinson's put their 190-year-old trademark up for sale on eBay. The sale was completed in 2012 to Confection by Design in Harrogate. The waterways, River Don and Don Navigation were used to transport coal from Doncaster to the steel production centres at Rotherham, Scunthorpe and Sheffield. A large number of mining jobs were lost in the late 1980s, and today coal mining has ceased. Rockware Glass is a specialist glass manufacturer. A production facility for chemical polymers was built on Wheatley Hall Road. It changed hands during its existence until DuPont closed it in the mid-1990s. Steel foundries, rolling mills and wire mills were built close to the railways that brought steel from Rotherham and Sheffield. Bridon Ropes produces wire rope, including the ropes used at coal mines to haul coal and miners. It is claimed to be the largest wire rope manufacturing plant in Europe. Bridon supplied wire rope for the Olympic Stadium for the 2012 Olympic Games. During the First World War and Second World War, the town became involved in munitions manufacture. During the Industrial Revolution the railway came to Doncaster, and the Great Northern Railway established the Doncaster Locomotive and Carriage Building Works. The reasons for this were Doncaster's communication links, the necessity to transport coal quickly and efficiently and Doncaster's expertise in specialist metal products. An extensive housing programme was undertaken for the increased population. The Chairman of the Great Northern, anxious about the workers and their families' spiritual welfare, persuaded the directors to contribute towards the building of St James' Church, which became known as the "Plant Church". The railway also built St James' School. The Doncaster Plant became famous for building LNER 4-6-2 locomotives Mallard and the Flying Scotsman, as well as many thousands more locomotives. Current plant owner Wabtec continues to do refurbishment in Doncaster. Today, Doncaster railway station, on the East Coast Main Line, is linked to many towns and cities across the UK such as Wakefield, Leeds, Hull, Sheffield, Manchester, Birmingham, London, York, Darlington, Newcastle upon Tyne, Berwick upon Tweed, Edinburgh, Motherwell, Glasgow, and Lincoln. Doncaster PSB is one of the largest signalling centres on the UK network, controlling hundreds of route miles of railway. Doncaster International Railport is an important road-rail intermodal terminal. In 1909 Doncaster Racecourse was chosen as the venue for an airshow, after the world's first international air display in Reims, France in 1909. Around a dozen aviators were present, the most famous being Léon Delagrange and Roger Sommer. Samuel Cody (no relation to William F.Cody) in an attempt to win a prize offered by the Daily Mail for the first British pilot in a British aeroplane to fly a circular mile signed British naturalisation papers in front of the crowd with the band playing both God Save the King and the Star Spangled Banner. Unfortunately, he crashed his aeroplane on the first day of the meeting and made no significant flights. During World War I fighters based first from the racecourse, then a temporary airstrip near Finningley (later RAF Finningley and now Robin Hood Airport Doncaster Sheffield) and finally, in 1916, from a newly built airfield alongside the racecourse, were deployed to defend the east coast against Zeppelins. On a number of occasions fighters took off to search for the intruders but none were ever seen. The Royal Flying Corps station trained pilots for the war in France. Within months of the war ending the entire station was put up for sale and two of its three Belfast hangars, the same type of hangar that now forms the basis for the Royal Air Force Museum at Hendon, were sold to a Sheffield motor manufacturing company for storage and assembly at Finningley. The third of the hangars stayed in place, mainly housing buses, until the 1970s when it was knocked down and replaced with modern buildings. In 1920 the Government asked local authorities to assist in the formation of a chain of airfields so the country would not lag behind other nations in the provision of civil air services. Doncaster took heed and, with expert advice from Alan Cobham, on 26 May 1934, opened its 'aviation centre'. Development of the airfield continued and on 1 July 1936 an international service was opened to Amsterdam. On 1 November 1938, after long discussions with the Air Ministry, 616 (South Yorkshire) Squadron of the Royal Auxiliary Air Force was formed. Shortly after the outbreak of war in 1939 the squadron went to its battle station and played a part in the Battle of Britain. After the departure of 616 squadron its place was taken by the formation of 271 (Transport) Squadron composed mainly of requisitioned civilian aircraft and obsolescent twin engined bombers. 616 squadron was the first Allied jet fighter squadron, equipped with the Gloster Meteor, famed for using their wingtips to throw German V-1 Flying Bombs off course. In 1944, after being equipped with American-made Douglas DC-3 "Dakotas", the squadron moved south to take part in Operation 'Overlord' and later in the airborne invasion at Arnhem where Flight Lieutenant David Lord was awarded a posthumous Victoria Cross. After the war the airfield reverted to civilian flying and finally closed in 1992. In 1930, International Harvester (IH) started the production of agricultural implements at a factory on Wheatley Hall Road and later at another in the Carr Hill area of Doncaster. The first tractor built at the factory was a Farmall M, which came off the production line on 13 September 1949. Tractors were initially built from parts shipped from the USA. The Wheatley Hall Road factory was extended after the war with a new foundry to make the heavy castings. The factory started Crawler tractor production in 1953. By 1960 the factory was making a range of tractors from scratch, designed specifically for British and European markets, and sold under the 'McCormick International' name. Assembly moved in 1965 to the Carr Hill plant. In 1983 tractor production was moved to IH's other Doncaster factory at Wheatley Hall. In 1985, International Harvester sold its agricultural division to Tenneco, Inc. which then merged the operation with its subsidiary J.I. Case to form Case IH, who continued to design and build its European tractor range in Doncaster, shutting the David Brown Ltd. tractor factory near Huddersfield. The 350,000th tractor came off the production line in 1999. In 2000, the factory was purchased by ARGO SpA, an Italian-based agricultural equipment builder. Doncaster was the sole production site of the McCormick Tractors brand, and the factory employed around 380 people (although approximately 1,100 people are employed in the worldwide McCormick group). In December 2006 the parent company, ARGO Spa, announced that the Doncaster facility was to close in 2007 with the loss of around 325 jobs. The announcement was made only one week before Christmas. 61 years of tractor production in Doncaster came to an end in 2007 when McCormick tractor production was moved to Italy. Doncaster sits on the European Route E15 and is the starting point of European Route E13. The E13 connects Doncaster, Sheffield, Nottingham to London. In the United Kingdom, European route designators are not displayed on road signs. The M18 Junction 2 at Doncaster was the original intended starting point of the M1 motorway where the motorway meets the A1(M). The intended motorway design is evidenced in road maps. The M1 was extended northward to Leeds, which is why the E13 starts at Doncaster and follows the path of the M18 and the M1. Doncaster is situated on the A1(M) and M18 motorways, and is within 20 minutes of the key M1 and M62 motorways. The 15-mile (24 km) A1(M) motorway bypass cost £6 million and was opened by Ernest Marples in 1961. The former route is now the A638, and partly the A614 to Blyth. Doncaster is also an important railway town with a station on the East Coast Main Line. Doncaster is a European hub with a new international airport, Robin Hood Airport Doncaster Sheffield opened in 2005. Doncaster International Railport facilities link to the Channel Tunnel. New developments include campus facilities for Doncaster College and the Frenchgate Interchange (a unification of bus and railway stations with the Frenchgate Centre). The extension to the shopping centre and the new bus station opened on 8 June 2006, when all Doncaster bus routes started to use the station. In 2011, Doncaster had a population of 109,805 which makes it very slightly larger than Rotherham. In 2011, 15.1% of Doncaster's population were non white British, compared with 8.2% for the surrounding Metropolitan Borough of Doncaster. This makes Doncaster more ethnically diverse than both Rotherham and Middlesbrough. Doncaster town has twice the percentage of Asian people compared with the borough, and a slightly larger percentage of black people. Doncaster Museum and Art Gallery is the town's main museum. It opened in 1964, and explores natural history, archaeology, local history, and fine and decorative art. It has a major exhibit dedicated to silverware and trophies won at Doncaster Racecourse. The museum houses the Regimental Museum of the King's Own Yorkshire Light Infantry. The aircraft museum Aeroventure is based on the site of the former site of RAF Doncaster at Doncaster Lakeside. The Trolleybus Museum in the nearby village of Sandtoft specialises in the preservation of trolleybuses, and claims to have the largest collection of preserved trolleybuses in Europe, with over 60 examples. Markham Grange Steam Museum, in a garden centre in the nearby village of Brodsworth, features a private collection of steam engines. Cusworth Hall is an 18th-century Grade I listed country house in Cusworth. It is open to the public and features displays documenting the history of South Yorkshire. 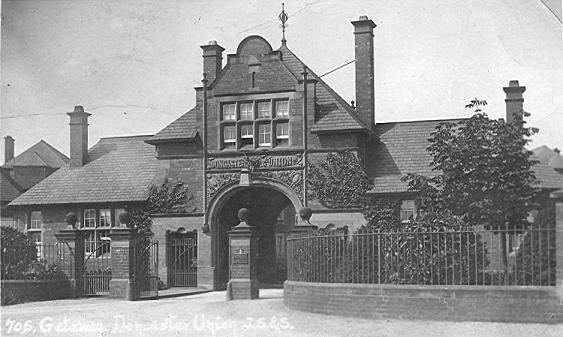 Doncaster Mansion House features an art gallery and displays on local history. Ashworth Barracks Museum is a military museum in Balby telling the story of the men awarded the Victoria Cross. It also houses a First World War exhibit including a 'Weekers Helmet' one of only two known to exist in the UK. Cast is the new £22 million venue opened officially on Monday 2 September 2013. Cast includes a 620-seat auditorium, a flexible studio space, drama studio, dance studio, education and ancillary space, and a large foyer with a café. Its director was Kully Thiarai, formerly of the Contact Theatre, Manchester. The Doncaster Little Theatre is a 99-seat community theatre which puts on their own in-house shows including a pantomime, along with 2 films a month during the day. Hire companies also use the theatre space for their own shows. The town has a 7 screen multiplex Vue which is currently undergoing work to be expanded. Events and concerts take place at Doncaster Racecourse and The Dome Leisure Centre. The Silver Street, Cleveland Street and High Street areas have over 40 bars and clubs within a 2–3 minute walk of each other and other bars can be found on Priory Walk, Lazarus Court, Bradford Row and around the Market Place. Various restaurants serving food from around the world can also be found in the town centre, especially in the Netherhall and Copley Road areas. From around the 16th century, Doncaster embraced the wealthy stagecoach trade. This led to horse breeding in Doncaster, which in turn led to the start of horseraces there. The earliest important race in Doncaster's history was the Doncaster Gold Cup, first run over Cantley Common in 1766. The Doncaster Cup is the oldest continuing regulated horserace in the world. Founded in 1951, Doncaster (formerly known as Doncaster Dragons RLFC and Doncaster Lakers) have played consistently in rugby league's National League One and its successor the RFL Championship, with its home at the Keepmoat Stadium. Doncaster Knights Rugby Football Club has shown success in recent years, being the most promoted club in English Rugby Union History, and competing at the top of National League One. 2008 saw the completion of the 1650 seater De Mulder – Lloyd stand at Castle Park. The creation of the new RFU Championship means that the Knights compete in the newly launched second tier of professional rugby in England. Recent leisure developments include a new community sports stadium for sports teams including the towns men's football club, Doncaster Rovers F.C., and one of the most successful women's football clubs in the country, Doncaster Rovers Belles who play at the Keepmoat Stadium. It is also the home of the British professional wrestling promotion One Pro Wrestling. Speedway racing was staged at Doncaster Greyhound Stadium in 1969 and 1970. The team was known as the Stallions and then the Dragons. The team raced in the British League Second Division. Doncaster has a men's basketball team called the Doncaster Danum Eagles who compete in National League Division 2. Doncaster has an American Football team called the Doncaster Mustangs, who are in Division 1 of the British American Football League.